corporate promotional gifts made of quality leather. Print your logo onto these custom printed business leather satchel or one of our other innovative leather compendiums and use them in your next marketing campaign as a unique giveaway item. Perfect for business promos and conferences! 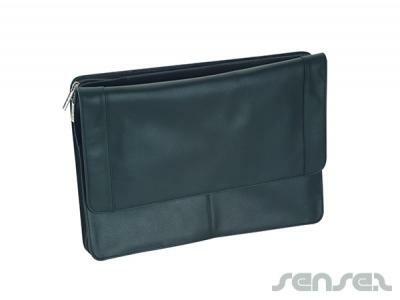 It features gusseted pocket, business card holders and pen loops with magnetic clasp and pen loops supplied with A4 lined pad which inserts from the top. Large gusseted section in the middle of compendium for handy and quick storage, (Pen not included). It is made from soft top grade cow hide leather the dimensions are 275mm(h) x 390mm(w) x 20mm(d). All prices are for 1 colour print in 1 position only. We also do in more than one colour at extra cost. Custom brand these essey leather compendiums (large) or one of our best-selling promotional compendiums»leather compendiums with your company logo! Your promotional business leather satchel can be silk screen printed in 1 or more colours. Costs shown include a 1 colour logo print on your custom branded business leather satchel. We can print more than 1 colour, however it incurs extra costs. We can achieve a perfect PMS colour match for the print. Personalise your business leather satchel or custom design leather compendiums for your marketing campaign. How can these unique promotional business leather satchel or our personalised leather compendiums fit in with your marketing strategy and help you maximise your brand exposure? Our custom made Business Leather Satchel can be produced from a minimum quantity of 50 pieces. We can have your logo branded on these corporate Business Leather Satchel in 1 Colour Silkscreen Print or 1 Colour Pad Print. A setup fee of AU$180.00 will apply to make the film.